Can you count on Microsoft after Windows 10? The time between when new versions of Windows are appearing is shrinking. Just when you think it is safe to buy a new PC then Microsoft brings out yet another version. Please do not be fooled by Microsoft's marketing machine that the next version of Windows (deliberately called Windows 10 to disengage your brain from thinking that it had anything to do with the last version Windows 8) is an advancement; it is not, it is a correction. Windows 10 principally corrects the wrong philosophy of operation introduced in Windows 8 (and 8.1). That was driven by the emergence and popularity of tablet PCs and phones and considered that all devices, whether touch screen or PC, could be used in the same way with one operating system. Thus, when used on a PC, Windows did not boot into the usual desktop but gave you an Apps screen instead. When you did get into the desktop there was no start button from which to control anything. Unless you installed a third party start button, the Windows desktop was about as useful as a car without a steering wheel. Now after this debacle, there occurred two significant changes in Microsoft. The first was the early retirement (or removal) of the CEO Steve Ballmer and the appointment of Satya Nadella (a techie) instead; the second was that Microsoft have stopped being driven by what the kids on the street want but by the needs of two thirds of their customers, the business users. The result of these two events is Windows 10 which, as mentioned above, corrects the philosophy by adapting the operating system to work on a variety of devices and does not try to adapt the user. 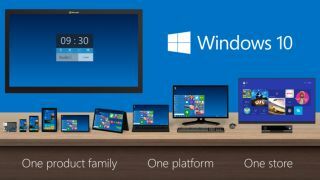 Windows 10 running on a PC once again opens to a proper desktop and has a start button, whilst on a tablet, a phone, or a touchscreen PC it will use the Apps Side. In fact, the start button is now a 'super' start button which incorporates not only the usual menu but Apps as well. These Apps now open in normal windows on the desktop thus ending the switching to the Apps side (also known as the Dark Side). In addition, you can have multiple desktops enabling you to have different setups, for example, for work and play. Other than these aspects, Microsoft have not mentioned anything else of significance. Missing is the replacement of the hierarchical file storage system with a database system. In this, you would have been able to store your files in one location and set up your own folder structures to access them. This feature was to be introduced with Windows Vista, but Microsoft still do not seem to be able to get it to work four versions on. In conclusion, the next version of Windows appears to correct many of the previous failings caused by Microsoft's perception of what their customers want, and the change of CEO also appears to have refocused the business back to the technicality of Windows as an operating system. The most significant aspect, 'will it work for business? ', still needs to be demonstrated. The answer to that is probably yes, and better than Windows 8, but moving Apps to desktop will only (potentially) increase the number of distractions to the user. As always, third party software will come to rescue and make it work properly, so there is hope.